My publisher started shipping the first hard copies of my book ‘customer experience withouth borders: a practical guide to social media in financial services‘ back in June. Last week, I proudly announced the availability of the kindle version! After a successful soft launch and a few hundreds copies of the book already sold all over the world in countries such as the UK, France, Spain, Switzerland, the US, Brazil, Japan, Singapore and Australia, my publisher organized our first official book launch party (London, 12 September 2011). I had the opportunity to talk the crowd (30+ journalists, students and financial services professionals) through the story behind Visible-Banking.com and my book, and answer questions from an engaged audience. As I was going to travel to the Asia Pacific region in October and November, I was keen to put together similar ‘book launch’ events in Singapore andAustralia. I love Singapore. It is one of my favourite cities in the world, and I’m seriously thinking of moving there within the next 12 months. We organized the Singapore book launch party at a very cool venue that I strongly recommend you consider using for your own events: Ying Yang at the Club Hotel. They have a brilliant roof terrace and the service was impeccable.During those events, I’m always keen to invite exclusively financial services professionals and journalists. Those events are not open to vendors and other digital agencies.In Singapore, we received about 20 registrations from the following financial institutions: Aviva Investors, DBS Bank, Maybank, OCBC Bank, Standard Chartered Bank, Swift, UOB, Visa. It was great to make new connections in Singapore, and catch up with the dynamic Standard Chartered Breeze Team (Aman Narain, Asif, Kanags,Katherine ‘the world’s coolest intern’ Liew…), the DBS team -Visible Banking workshop’s alumni-, Sandra -an ex colleague at SWIFT-, Rob ‘theBankChannel’ Findlay and Scott Bales a good friend and now colleague of Brett ‘Banking 2.0’ King. I very much look forward to contributing to ‘Next Bank Asia‘ in April next year. The event was very relaxed and informal. As I knew most people in the room personnally, and most of the participants were familiar with my work on Visible Banking and aware of my book, I kept my speech short. As promised, I will shoot a picture of me wearing the T-shirts as soon as I am back in London! Aman and his team have been among the earliest supporters of me and my work, and it is always great to catch up with them in person. So if you couldn’t join us in London, Singapore and Sydney, this is what you missed. But I’m travelling quite a bit, and I am regularly invited to speak at conferences all over the world, so chances are I will come near you in the next few months. Please check Visible Banking on regular basis, I’m keen to connect with you in person and discuss the exciting topics of social media and digital engagement in financial services. In the meantime, I invite you to find more information on my book at http://www.SocialMediaFinancialServicesBook.com and check outthe reviews on Amazon.com. My publisher and I have already put together half-a-dozen sizable deals with financial institutions in the UK, France, Singapore and Australia. We would be delighted to put together a similar deal to distribute the book within your organization. 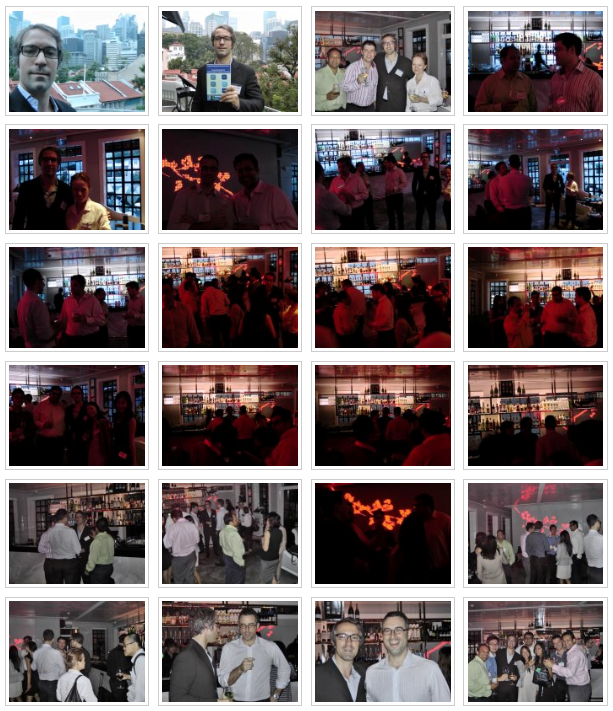 I invite you to check the pictures we shot during the event. As usual feel free to like and comment them, and add yours.